Customers and staff at BSS House Business Centre, Swindon's first business centre, celebrated the site's 30th birthday with an 80s themed fun day. Customers and staff at our BSS House Business Centre in Swindon stepped back into the era of neon, perms and power ballads with an 80s themed fun day to celebrate the site’s 30th birthday. BSS House was Swindon’s first ever business centre and to honour its landmark birthday its on-site team arranged the fun day to raise money for The Swindon Therapy Centre for Multiple Sclerosis. Numerous customers in the 73-strong business community, including Marketeam and Dermott Brannigan, came to work in fancy dress and embraced the fashions of the 80s. The business centre was open to the public during the day and one of the site’s longest serving customers, Michael’s Tailoring, held an exhibition of how tailors looked 30 years ago, displaying photographs of staff from the era. One of the highlights of the event was a space hopper race, with participants from our customers Screaming Media, Marketeam, Dermott Brannigan, Swindon Party Warehouse and MIC Italian Foods, as well as Labour parliamentary candidate for North Swindon, Mark Dempsey, who came along to join in the fun. 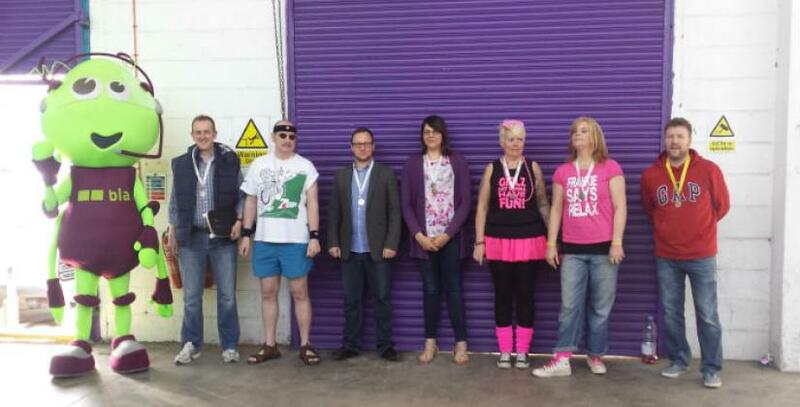 The race was won by Gareth Morris of Swindon Party Warehouse and all contenders were rewarded with medals. The official starter for the race was the alien mascot from Big Local App. "We are really proud to be marking this important milestone in our history and to have played a part in the foundation of so many other local companies. Over the years more than 500 businesses have had their home at BSS House and 13 of our current occupiers have been with us more than 10 years." Bizspace’s Sales and Marketing Director, Emma Long, adds: “At Bizspace we love to celebrate success – whether that’s our customers, our staff, or our centres – and the more people who can join in the fun, the better. The team started the celebrations in March, to mark the site's longest serving customer retiring at the age of 71 and they don't stop here. Our BSS House team is already planning a big summer birthday party for the site which we are sure will be a huge success! BSS House has a thriving community of businesses over its 100,000 square feet of business space for rent. From offices and workshops to studio space and industrial units, as well as mailboxes, meeting rooms and on-site business facilities, BSS House has so much to offer, all in a convenient location with spacious parking facilities.